Russian Revolution is the event of change of Russian form of government from monarchy to Soviet Republic in 1917. During World War 1, the trembling military and economic situation of Russian Empire paved the way for abdication of Tsar Nicholas II by the Russian imperial parliament Duma in March 1917. But the Provisional Government continued Russia’s participation in the World War 1 which was not acceptable for Bolsheviks (radical socialists). The Bolsheviks formed their military wing, Red Guards, and overthrew the Provisional Government in November 1917. Soon after the empowerment of Bolsheviks, the Russian Civil War started that lasted till 1922 with victory for the Bolsheviks and they transformed Russia to Soviet Union. · The economic condition of Russia was not stable since the beginning of 20th Century. This situation, along with Russia’s humiliating defeat in Russo-Japanese War, was used by socialists very effectively. The declining economic condition suffered the factory workers and peasants alike. The general strikes of factory workers increased many folds in the start of 20th Century and later the Russian Revolution of 1905 forced the Tsar Nicholas II to establish Duma (parliament). It was a big achievement for socialists and also provided them valuable experience for a revolution of larger scale in 1917. · The World War 1 started in 1914 in which Russia took part as one of the Allied Powers, opposing Central Powers. But the Russian Army suffered several defeats at the hands of Germany on the eastern front of the war and the causality rate was climbing with the passage of time. The defeats in war also brought economic instability and shortage of necessities of life (especially food shortage). This gave rise to protests by workers and mutinies by the soldiers (there were large number of conscript soldiers in the Russian military in 1917). February Revolution was the result of this situation. In February 1917, the situation became uncontrollable for the administration due to widespread strikes by workers (including women), students and teachers for their demand of bread and other necessities. Tsar was on the battlefront and he ordered the army on 11th March to suppress the riots by force. But due to mutiny among the soldiers, the orders could not be followed. Tsar reached the capital Petrograd on 14th March and he decided to abdicate throne to his brother Michael Alexandrovich on 15th March over advice from Army Chiefs and other ministers. But Michael refused to take the position without a consensus. After his refusal, a Provisional Government was announced on 16th March 1917 by Duma and Tsar Nicholas II was placed under house arrest along his family at the Alexander Palace. The Provisional Government was made up of centre-left members that were in majority in Duma. Georgy Lvov became the first Russian Prime Minister of post-monarchy era. He belonged to a liberal Constitutional Democratic Party. The socialists formed their own bloc in Duma, known as the Petrograd Soviet (workers’ council). Although the liberals were in control of provisional government, the socialists also had strong influence in workers and soldiers. Therefore, the Provisional Government was like a dual power where liberals were in charge and socialists were a pressure group. On seeing greater role of socialists, they were offered by the Provisional Government to take part in the government. Most of the socialist parties declined the offer but a moderate faction Socialist Revolutionary Party (SRP) joined the government and its member Alexander Kerensky became the second Prime Minister of non-Imperial Russia on 17th July 1917. The new government continued the participation of Russia in World War 1 while it was opposed by the more radical faction of the socialists, the Bolsheviks. The continuous participation of Russia in World War 1 was bringing more defeats, deaths and shortage of supplies of food and other necessities of life. Germans were aware that Bolsheviks are against the war. The Bolsheviks’ leader Vladimir Lenin was in Switzerland. Germany brought him in train from Switzerland to Russia in order to strengthen the Bolsheviks so that pressure could be increased on the Provisional Government to end its participation in the war against Germany. Lenin returns to Russia in April 1917. In June 1917, the Russian army opened an unsuccessful offensive against Central Powers and the counterattack of the opponents proved disastrous for the Russian military. 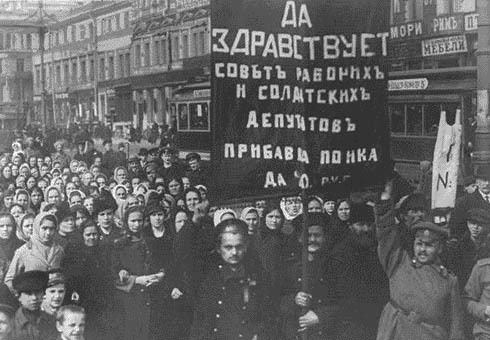 The Bolsheviks and their supporters started demonstrations in Petrograd (known as July Days) demanding all power for the soviets but these demonstrations were suppresses by the Russian government. The government was aided by moderate socialists (SR, Mensheviks) and monarchy-supportive organization the Black Hundreds. All the important leaders of Bolsheviks were arrested while Lenin fled to Finland. But Bolsheviks were able to restore their influence in August 1917 as a result of the Kornilov Affair. In August, Russian Supreme Commander Lavr Kornilov ordered his troops to pacify the city from radicals which was a coup attempt against the Russian Government. PM Karenski sought help from Bolsheviks and Red Guards and the coup failed due to Bolsheviks influence over workers and soldiers which halted the mobilization of Kornilov’s troops. Later, Kornilov was dismissed from his position. For their support, all the jailed Bolsheviks were freed by the government. After seeing favorable conditions, Lenin returned from Finland to Russia in October 1917. Lenin pressed on the overthrow of the Provisional Government. The Bolshevik Central Committee passed the resolution of armed resistance against the Provisional Government on 2nd November (20th October according to Julian calendar) 1917. The Military Revolutionary Committee (MRC) of Bolshevik party started taking action on 7th November (25th October) 1917 and soon captured the important buildings including Winter Palace in Petrograd. Soon after the October Revolution, the Russian Civil War started between the Bolsheviks Red Army and the anti-communist forces known as the White Army. Russian nationalists, monarchists and moderate socialists were present in the White Army. During Russian Civil War, several separatist movements also started in the areas of Baltic, Eastern & Central Europe, North Caucasus etc. The White Army was also aided by several foreign powers including UK, USA, Japan, France etc. The Civil War lasted from November 1917 to October 1922. White Army gained few successes in the beginning of war but the Bolsheviks, supported by masses of Russian population, decisively defeated the White Army in the Russian Civil War. The Red Terror by Cheka (Bolsheviks secret police) also played important role in victory of Red Army while Estonia, Latvia, Lithuania, Finland and Poland gained independence. Emperor Nicholas II and his family were under house arrest since his abdication in March 1917. After October Revolution, the imperial family came under the arrest of the ruling Bolsheviks. After the start of full-scale Russian Civil War, the Imperial family was placed to Bolshevik stronghold of Yakaterinburg in April/ May 1918. The White Army was gaining victories in the war due to which there was danger that they could reach close to the imperial family. In this situation, Nicholas II was assassinated along his family members and servants on 16th July 1918 by their Bolshevik captors. After French Revolution, the Russian Revolution was the second most important revolution of Europe that created several major immediate and long-lasting effects in Russia and the whole world. · Soon after the Russian Revolution in 1917, several other areas in Europe, Asia and America took effects from the revolution but most of these efforts failed in other parts of the world till the end of World War 2. The victory of Soviet Russia in WW2 against Germany assisted the Soviet Union to spread its influence and communist ideology in other parts of the world that initiated the Cold War between Soviet Union and USA (the two new world powers). · The Russian Revolution changed the whole society, culture and governmental system of Russia. All the large industries and agricultural farms came under direct control of the government. In long term, this policy proved disastrous for economy. · The new regime suppressed any opposition very brutally. During Stalin’s era, numbers of detention camps (Gulag) were established in various parts of Russia where the opponents were put in large numbers and many among them died there due to cruel treatment by authorities and hard living conditions. From many parts of Russia, even the whole population was exiled to other parts. A prominent example is the people of North Caucasus and Crimea who were exiled to Siberia and Central Asia.